What should be included in the project’s cost? For any lighting project, both the capital cost and the operational and maintenance costs must be estimated. Projects are often evaluated on a life cycle cost basis, as an installation with a higher capital cost but a lower operating cost may be more cost-effective over its lifetime than an alternative option that has a low capital cost and higher operational costs. For example, when considering LEDs with burn times of 50,000 hours, compared to other lamps which may last 18,000 hours or less before replacement, life cycle costing can be key to deciding which of these two systems is more cost-effective over its lifetime. Life cycle cost analysis should provide you with an overview of the cost of the lighting design project throughout the whole project life, from the procurement stage, through installation, commissioning and testing and finally operation and maintenance. Typically, the initial capital cost includes the cost of the design process, procuring the equipment and the installation process including commissioning and testing the installation. The operational costs include the electricity consumption and maintenance (such as cleaning and replacing lighting components) throughout the life of the installation. Budget may also have to be set aside for the disposal of redundant equipment. How can I understand the operational lifetime of a selected lighting system? Various lamps have different lifespans referred to as “Average Rated Lifetime Hours” (ARL). The term indicates how long it takes for a certain percentage of light bulbs in a test batch to fail and is measured in hours. For example, if 100 bulbs were tested and 50 (or 50%) of them failed after 1,000 hours, this bulb would have an average rated life of 1,000 hours. Hence the ARL is popularly known as half-life. ARL of traditional lights are highly predictable (please see the previous card for more information). However, LEDs don’t have the same type of failure. They are long-lasting light bulbs that do not normally burn out; instead their brightness slowly decreases over time. This phenomenon is called lumen depreciation, i.e. the time at which it degrades in light output to a given percent of its initial value. A typical LED’s rated life is when a lamp reaches 70% of initial brightness. This designation is represented by a label L70. 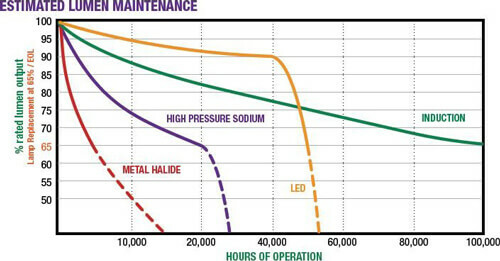 The rated life of light sources is different from the lumen maintenance life. While the former serves as a reliability value that is required by luminaire makers and end users, the latter compares the amount of light produced by a brand new lamp with its light output at a specific time in the future. See the Back of the envelope for more information about lumen maintenance life. Each different type of lamp has a different average lumen maintenance life, as seen in the example chart below. This information is useful when considering whole-life cost of a lighting system, appropriate warranty coverage, and maintenance schedules.